An exciting tile-laying completion between 2 players. Carcassonne the Castle uses the same draw a tile - play a tile system that is used in Carcassonne. Like Carcassonne players can choose to place one of their followers on one of the scoring elements of the castle tile at the time it is placed. Score completed elements and retrieve your follower for future use. 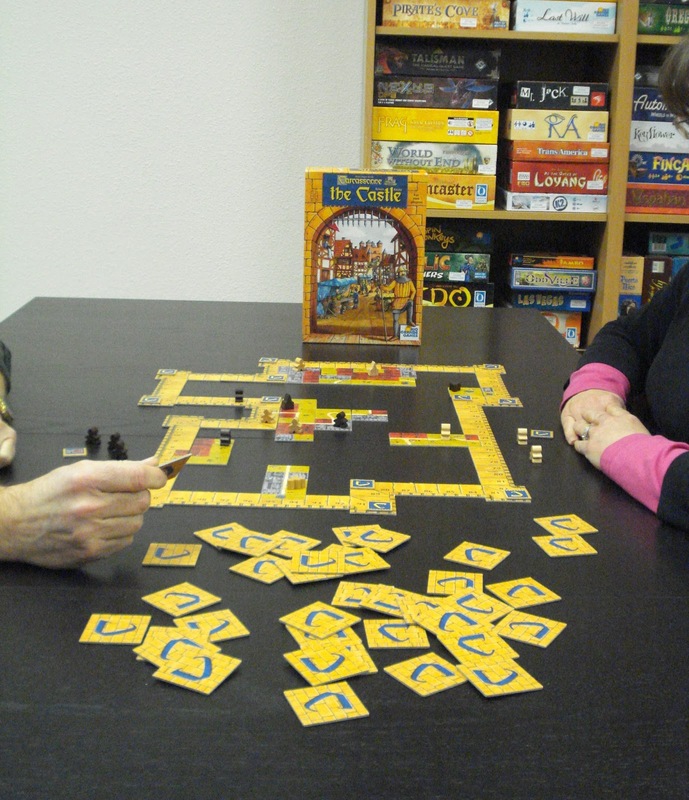 The scoring elements on the castle tiles are paths, houses, towers, and markets. There is a scoring track (the castle wall) that encompasses the playing area. The scoring track serves two additional functions in addition to keeping score. First it provides 7 different starting locations for castle tiles to be played. Second, there are 12 corner spots for special wall tiles which can be gained when a player’s score lands exactly on one of these spots. Wall tiles provide significant advantages when claimed. They can double the score of a completed house or tower. They can yield victory points, an extra turn, or the ability to score an unfinished element at game end. This brings up some interesting tactical decisions. If I am within easy reach on the scoring track of a special wall tile do I used my drawn castle tile to complete a low scoring element and take the special wall tile? Or, if I have the opportunity to use this castle tile to complete a higher scoring element do I take the higher score and miss out on the special wall tile leaving it behind for my opponent to shoot for. There is only one special wall tile per location and any left behind can be claimed by your opponent if they can manage their score to land on them. Another interesting scoring twist is the award of points at the end of the game to the player with the largest completed house. This bonus value is based on the largest unoccupied area inside the castle. This puts a premium on the one point per castle house tile over the two points per castle tower tile. Castle paths score one point per tile unless at least one of the castle paths is connected with a fountain which then doubles the score. Castle markets claimed with a player’s follower scores 3 points per tile. However, a special wall tile for markets will increase the value to 4 points per tile. During the game a player claims a market tile by laying his follower down on it. This follower remains on there through the end of the game and cannot be reclaimed and played again like followers positioned on other scored elements. 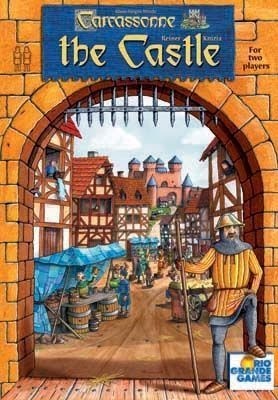 We have an open copy of Carcassonne the Castle available in our Store Demo Library for you come in and try out.